America is the greatest country in the world…really? 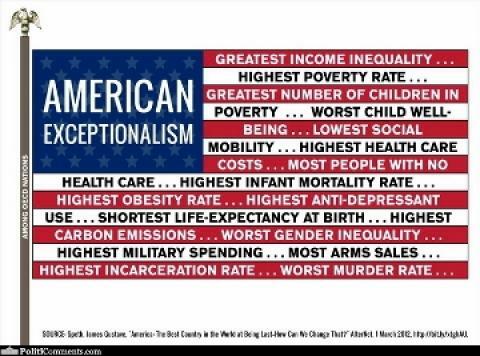 Watching the CNN debate yesterday I heard several occasions again one of the Republican Presidential Candidates citing some version of the phrase “America is the greatest country in the world!” I just really want someone to inform me how is America the greatest country in the world. Seriously, can someone please educate me as to the rationale behind that statement, because if it is the greatest country in the world I will happily support the statement. It would seem that the citizens of America don’t think it’s the greatest, and the younger the age of the person surveyed, the less likely it is that they believe that the US is #1. I ask this question genuinely looking for people to tell educate me as I want to understand how so many Americans continue to tell us that they are the best in the world. A quick scan of the internet makes it difficult to see how anyone can read any international standards that rank them at #1 in anything other than incarceration rates of their own population. Now I want to make it clear, I am not suggesting they are the worst country in the world, I am also not suggesting that it isn’t a ‘great’ country, what I am wanting to know is is it the greatest? Show me the markers and I’ll accept them. There is a very famous scene from The Newsroom’s very first episode of the very first series where this question gets asked. Now this is fictional, but fact checking his information at the time the episode was filmed…he seems to be basically accurate in the statistics he is giving out although there is a little wriggle room depending on the research you cite. Please, educate me, is America the greatest country in the world? Why, or why not? Sarah Palin interviews Donald Trump – what the internet was designed for!!! I saw online last week that Sarah Palin was going to be interviewing Donald Trump on her One America News Network show I initially was gravely concerned for the safety of the world. It was a deep concern with a warning in the recesses of my mind where all I could think was that if these two ever crossed paths then all life as we know it stopping instantaneously and every molecule in your body exploding at the speed of light but then I remembered that was a the warning from Dr Egon Spengler to the other Ghostbusters as to why they shouldn’t cross their streams. Mind you, allegorically sparking, the crossing of two such moronic individuals may lead to the same outcome. I’ve said it before and I’ll say it again, I love the American political system…mostly because I don’t live there and can look at it from the relatively safety of New Zealand. American politics is the best entertainment show in the world and with Mr Trump, who communicates like a seven year old, and Ms Palin coming together it was like the two best comedic characters in that show combined for a brief moment bringing joy to the world (outside America). The content of the interview can be viewed below, I would encourage you to watch it to see what the world could look like if either of these people would be involved in the Whitehouse (which I don’t think they will) but for now, as I have used a couple of movie references in this post, it’s probably appropriate that I now use one that best identifies what the interview actually was. From an outsider looking in, the only thing greater than having Donald Trump go deep into the Republican primaries, would be if he announced that Palin would be his running mate…OMG I am having palpatations at just the thought of the 24 hour news networks covering them. Seeing Palin in a situation again where she has to fend off other ‘gotcha’ questions like “what newspapers do you read?” is almost too much for me to take.